During 2016 Blast Theory and acclaimed author Tony White worked with a group of 30 young people in libraries in Telford and Wrekin, Worcestershire, and Staffordshire, to re-imagine libraries, story telling and their place in the world. On 29 October 2016, over the course of 9 hours from 3pm to midnight, the young people then took control of their local libraries, and performed live to a worldwide audience, via an interactive live stream, broadcasting from each library in turn. This book is a result of that process. 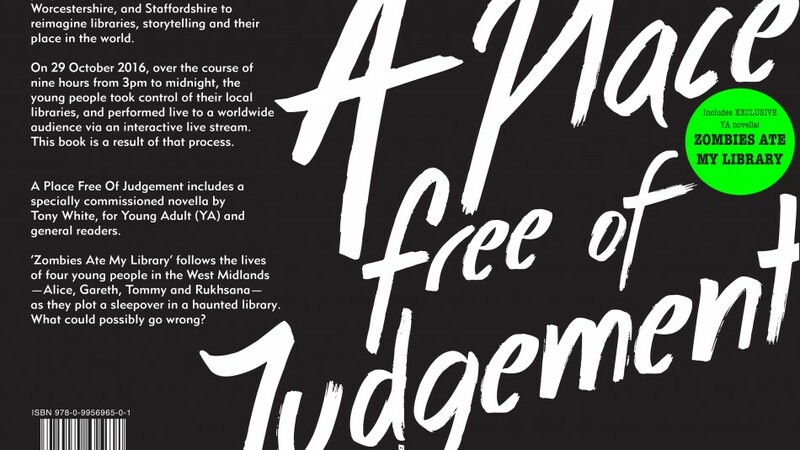 A Place Free of Judgement includes Tony White’s specially commissioned novella for Young Adult (YA) and general readers, ‘Zombies Ate My Library’, which was performed as a series of readings by White during the live stream on 29 October, and which draws on ideas, conversations and off-cuts that emerged in the workshops and during the development of A Place Free of Judgement. ‘Zombies Ate My Library’ follows the lives of four young people in the West Midlands—Alice, Gareth, Tommy and Rukhsana—as they plot a sleepover in a haunted library. What could possibly go wrong?